Installing Extensions on a Virtuoso Hosted MediaWiki? MediaWiki is a popular open-source wiki engine written in PHP. 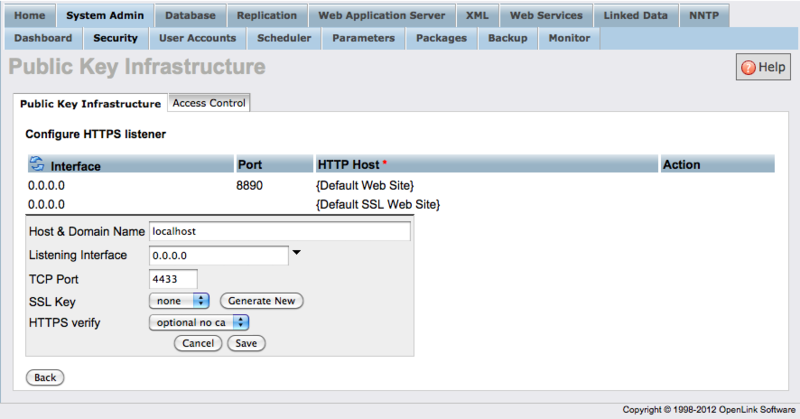 The guide below shows how to run it in Virtuoso. This will install MediaWiki version 1.18.4 and Semantic MediaWiki version 1.8 . Click the complete the installation link. This will open a Language selection page. Tip: If you have run the mediawiki installer before it may remember you settings and not start the installation from the beginning. In this case you should click the restart installation link in the menu on the right hand side. Select your language and click the Continue button. This will open the Welcome to MediaWiki page. About half way down the page there should be a green message saying The environment has been checked. 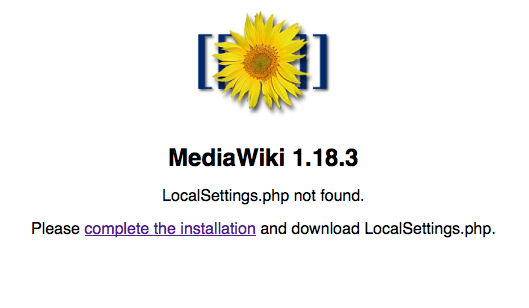 You can install MediaWiki?. Click the Continue button at the bottom of the page. This will take you to the Connect to Database page. Virtuoso should be selected for you. When using Virtuoso there are no further settings required so just click the Continue button. Setup the name of your wiki the and Administrator account. Select Ask me more questions before clicking Continue to enable VirtuosoAuth?. On the Options page in the Extensions section select VirtuosoAuth. Click Continue. Once the tables have been created you will be propmpted to download LocalSetting.php. Move the downloaded LocalSettings.php into virtuoso installation folder/vsp/vad/vsp/MediaWiki. The VirtuosoAuth extension extends the way users can be authenticated in MediaWiki. With the extension enabled, usernames and passwords are authenticated by Virtuoso as well as MediaWiki. What this means is that an existing Virtuoso user does not have to specifically set up a MediaWiki account, just use her Virtuoso username and password in the MediaWiki login dialog. In addition, the extension allows users to authenticate themselves using an OpenId or WebID. In either case a matching MediaWiki user is silently created the first time the user logins in. In order to use a WebID you will need to do some further configuration. Please see the Additional setup required for WebId Setup section. In the case where authentication is via an OpenId or WebId and the username from the OpenId or WebId matches an existing MediaWiki username then the user is prompted for the mediawiki password. The OpenId or WebId is then associated with that MediaWiki user. If your instance of Virtuoso has the ODS-Framework installed then the VirtuosoAuth extension will attempt to authenticate users as ODS users. Additionally, when a new mediawiki user is created an ODS account will also be created for that user. New MediaWiki/ODS users can be created from a username and password or from an existing OpenId or WebId. Additional setup required for WebId. If you want to be able to login using a WebId? you will need to set up a secure sockets server in Virtuoso. Open the Virtuoso Conductor, http://yourvirtuosohost:port/conductor. Select the System Admin tab and then the Security tab. This opens a form for creating a security certificate. Fill in the fields and click the Generate button. This will create the certificate. You should now see the Configure HTTPS Listeners button. Click the Configure HTTPS Listeners button and fill in the Host or Domain name and the Listening Interface in the listener configuration form. Generate a new key by clicking the Generate New button. Click Save. You should now see a Configure ODS Endpoints button. Click this button. Click the link to Create a New End Point. You can test the endpoint clicking the endpoint link. Tip: If there is a problem finding the certificate, you may need to restart your browser. You can now edit LocalSettings.php so that $wgSecureServer is set to your https listener. The VirtuosoAuth? extension now has suppport for Webid based access control lists. It can be configured using the LocalSetting.php file in root of your MediaWiki? installation. If there are no tags in the document then it is readable and writable by all users. If there is an tag on a page then the current users is silently given read and write access to the page when it is saved(they must already have write access because they are editing the page). This avoids the situation where you forget to add yourself to the ACL and once the page is saved you can never access it again. Note that as soon as a page is edited by another user then that user will get read and write access and the original page creator will lose it unless they are added to the access control list. 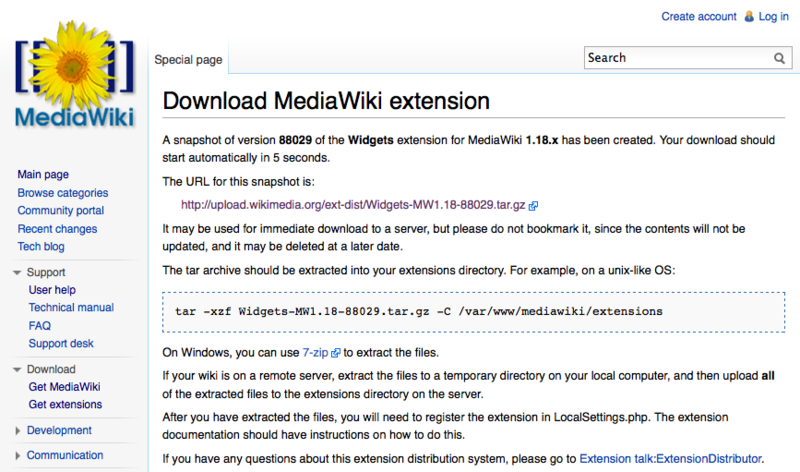 Extensions let you customize how MediaWiki looks and works. There are many extensions available to download from the MediaWiki web site. For general instructions on installing extensions see the Extensions manual page. Extensions can be downloaded using the the Extensions Distributor or from the extensions page on the MediaWiki web site. Select the required extension from the drop down list. Click the Continue button. If there are different versions of the extension available you can choose the one that matches your version of MediaWiki. If you have installed the Virtuoso VAD then you have MediaWiki version 1.18. Once you have selected the version click the Continue button. You will then see a confirmation screen with some instructions for unpacking the download. Your download should start automatically. Move the downloaded file to the extensions folder of your MediaWiki installation. This will be in your Virtuoso installation folder/vsp/vad/vsp/MediaWiki/extensions. Unzip the extension. Extensions are enabled in the LocalSettings.php file in the root of your MediaWiki installation. Typically, this will mean adding a line similar to the following at the end of LocalSettings.php. Some extensions will have additional settings that can be modified by adding them to LocalSettings.php. See the documentation for the particular extension that you are installing. After you have installed the <nowiki>MediaWiki</nowiki> mediawiki_fs.vad package you may want to set up Linked Data Views of the MediaWiki database tables. The benefits of doing so are described in [[http://virtuoso.openlinksw.com/wiki/main/Main/MediaWikiSIOCRef][MediaWiki SIOC Reference]]. The MediaWiki Linked Data Views script can also be found here. You can download the MediaWiki VAD package from here. Installing and Configuring SemanticMediaWiki using Virtuoso? Installing and Configuring the LinkedWiki v2.0.1 Extension? Installing and Configuring the LinkedWiki v1.0.1.2 Extension?